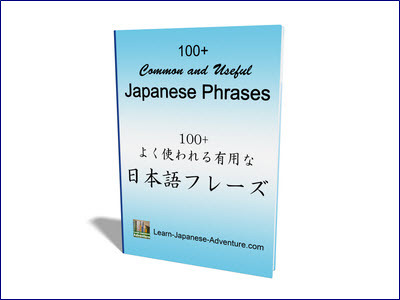 In this lesson you will get to learn the Japanese grammar used to express your intention of doing something. In fact there are two of them: つもり tsumori and the volitional-form or 意向形 (ikoukei). Be careful that since these grammars are used to express your own intention to do something, you cannot use them to express intentions of other people. Let's look at the first Japanese grammar つもりです (tsumori desu). Meaning: I intend to do ~. Meaning: I intend not to do ~. Meaning: I intend to go to Japan this summer holiday. Meaning: I will go to Japan this summer holiday. Meaning: I intend not to go anywhere this summer holiday. Meaning: I intend to eat soba this evening. Meaning: I intend not to eat anything this evening. This Japanese grammar is also used to express speaker's intention. Normally the volitional-form is not used alone but in conjunction with ～と思っています(~to omotte imasu) or ～と思います(~to omoimasu). Meaning: I am thinking of doing ~. Meaning: I am thinking of going to Japan this summer holiday. 行こう (ikou) is the volitional-form of the verb 行く (iku). So how are you going to change the verb to volitional-form? Group 1 verbs always end up with words containing u-sound. To change group 1 verbs to volitional-form, change the u-sound to o-sound in the last word. After that append う (u) to the changed words and you will get the volitional-form of the verb. For example, this group 1 verb よむ (yomu) ends up with む (mu). If you change the u-sound to o-sound, む (mu) becomes も (mo). Adding う (u) at the end, you will get よもう (yomou). Let's look at one more example, this group 1 verb かえる (kaeru) ends up with る (ru). If you change the u-sound to o-sound, る (ru) becomes ろ (ro). Adding う (u) at the end, you will get かえろう (kaerou). Changing of group 2 verbs is always much simpler as usual. All group 2 verbs end up with る (ru). To change to volitional-form, simply replace る (ru) with よう (you) and you will get the volitional-form of the verb. 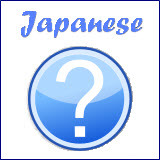 For example, this Japanese verb たべる (taberu) is a group 2 verb. To change to volitional-form, replace る (ru) with よう (you) and you will get たべよう (tabeyou). Let's use another example to show the change. This group 2 verb ねる (neru) means go to bed. Change る (ru) to よう (you) and you will get ねよう (neyou). Group 3 verbs are irregular verbs. You just have to memorize them. The volitional-form of くる (kuru) is こよう (koyou) and the volitional-form of する (suru) is しよう (shiyou). 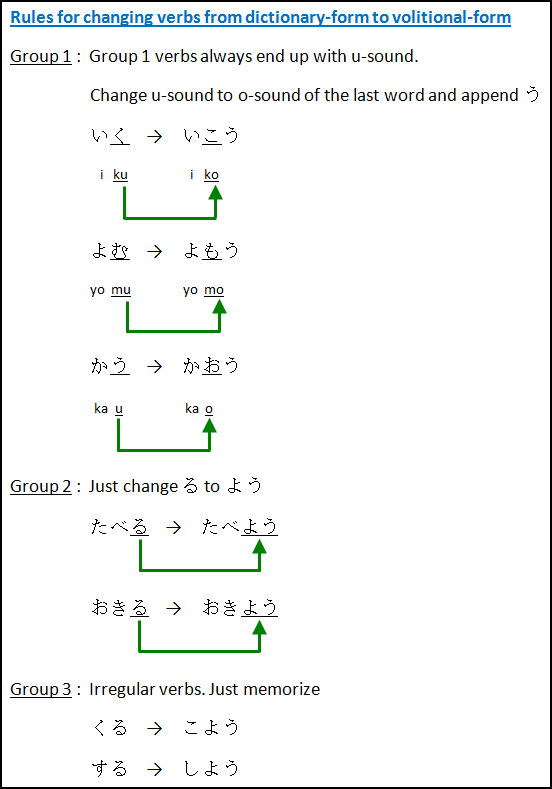 In summary, the following diagram shows the rules when changing dictionary-form to volitional-form for Japanese verbs. Let's make some sentences to express your intention of doing something using this Japanese grammar (volitional-form). See how each verb was changed to its volitional-form. Meaning: I am thinking of going to swim. Meaning: I am thinking of going to read a book. Meaning: I am thinking of going to play with my friend. Meaning: I am thinking of going to eat Japanese dish. Meaning: I am thinking of going to bed at 10pm. Meaning: I am thinking of going to wear a coat. Meaning: I am thinking of going to get up at 6am. Meaning: I am thinking of going to study. However, it's definitely not a good idea to ask questions on what other people intending to do in these ways. Because these questions contain meanings like "What are you up to?" or "I know what you are going to do something. How dare you do do such a thing?". It's more like questioning other people intention rather than your original meaning of "if he or she intends to go to Japan". 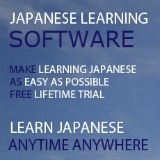 Meaning: Are you going to Japan in this summer holiday?. And if that someone has the intention to go to Japan, he or she can answer you using つもりです (tsumori desu) or volitional-form.